What does any country in the world have that we don’t? Is natural resource the driving factor? If yes, then shouldn’t Africa lead in these terms? Japan realized the key and developed it. They grew from a war ravaged country, from a country where two atom bombs have devastated everything to the fourth largest economy. It became the leader in technology. The key is human-resource. Human resource is not just the population but productive population, people who challenge the status quo and learn because that is how one develops oneself. Human resource is the key to become a developed country. Don’t have sufficient resources? The people will find a way to be productive without it or will find a way to make it. What makes for having the right human resource? It is education and not just literacy. We often come across articles that state the dismal state of our education system where a student of class 5 is unable to do basic arithmetic of class 2 and can’t read English. Let alone comprehend it. If this remains the case then how will they ever build on the concept? They will probably drop out or just manage to skim through classes without much value added to their knowledge. PlanetSpark is a novel method of plugging the gaps left by the conventional schooling. The lack of adequate attention to every student leaves doubts lurking in the young minds. This leads to students being disheartened and losing interest in academia. However, with PlanetSpark idea of partnering with mothers, it has created a way where no child will be left behind at least in English and Mathematics. The focus group of the PlanetSpark team is for the students of class 2nd to 7th. At this age, the children are forming their perspective towards life and this is the most crucial period as the lessons learnt here gets imbibed on the subconscious mind. PlanetSpark is igniting a spirit of learning and contribution to both the students and mompreneurs. Housewives get an avenue to use their talent and go beyond the realm and contribute to the society. They become self-employed with necessary support from PlanetSpark in form of marketing, connecting parents with these mompreneurs and study material. Also. the material is designed in a way to appeal the young minds through activity, colourful graphics, etc. 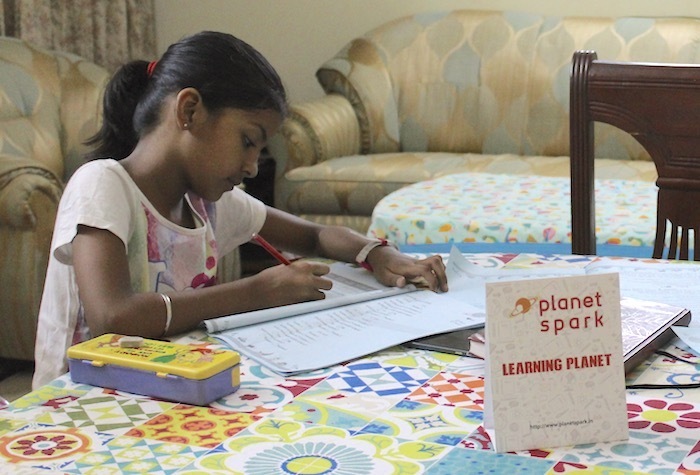 The parents also feel at comfort due to the vicinity with the learning planets as the focus of PlanetSpark is on providing such learning planets within a radius of 500 metres. The proximity helps in reducing precious time on the lengthy and tiring commute. Since the batch size is of five students and a mix of students from different classes. This helps in students setting their own pace of learning and without the unwanted peer pressure or of being left out. The parents easily get updates on their wards performance and can work on any issue if the need be. Here both the mompreneur and parents work towards a common agenda to provide the kids a platform to excel and marvel at what they do. This is just an abridged version of what PlanetSpark aims to do. In building the today they are in fact building tomorrow. It is addressing the vocational needs, which has always been a crucial factor in terms of self-dependency both financially and emotionally. A better future won’t be just good infrastructure but good human beings who will be compassionate, helpful and a can do spirit which will never bow down in the face of difficulties. PlanetSpark is doing this one day at a time. What is Game Based Learning and how can it benefit your child? Why mathematics is a necessary skill in life? PlanetSpark - Transforming housewives into mini entrepreneurs!